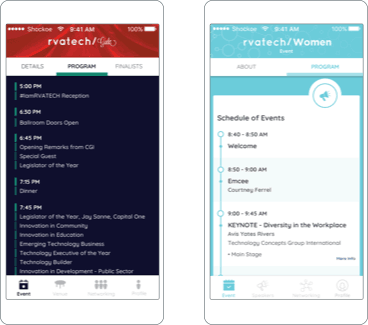 Shockoe helped RVA Tech create a customizable application template to improve the guest experience at conferences, galas, and events. 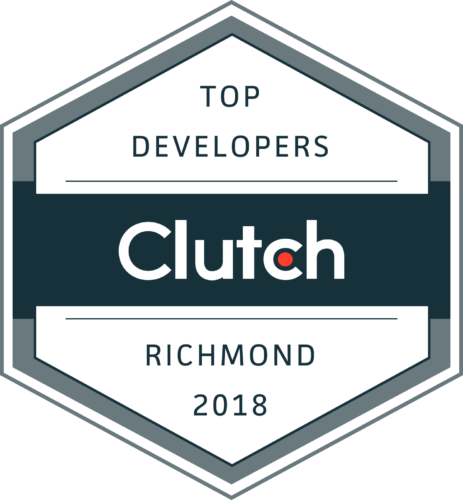 RVATech is a member-driven association of businesses and organizations working toward the growth of central Virginia’s dynamic technology-based economy. Their mission is straight-forward: to serve technology producers, users, and service providers supporting industries, organizations, and institutions. RVATech works to provide several relevant and timely networking events for its members throughout the year. These events include the Women’s Conference, the Gala Awards Ceremony, the Links Networking Event, and the Techsters Youth Camp. RVATech serves a broad member base in addition to the wide variety of supporting organizations. To serve this community, RVATech stages multiple events throughout the year for member networking, education, and business promotion. 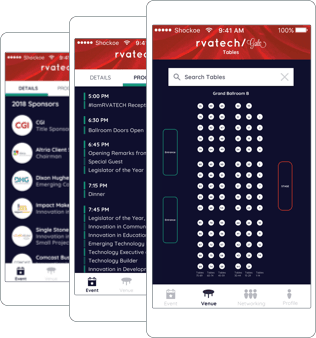 RVATech recognized that the growth of these events meant that they needed to provide members with a better way to access and manage event details, simplify networking, and encourage ongoing participation. Shockoe took the project head on. 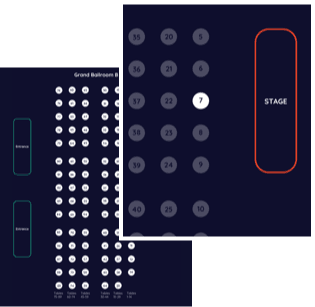 In order to reach the broadest possible audience and facilitate integrating with RVATech’s many annual events, Shockoe recommended building the app using React Native’s cross-platform framework. 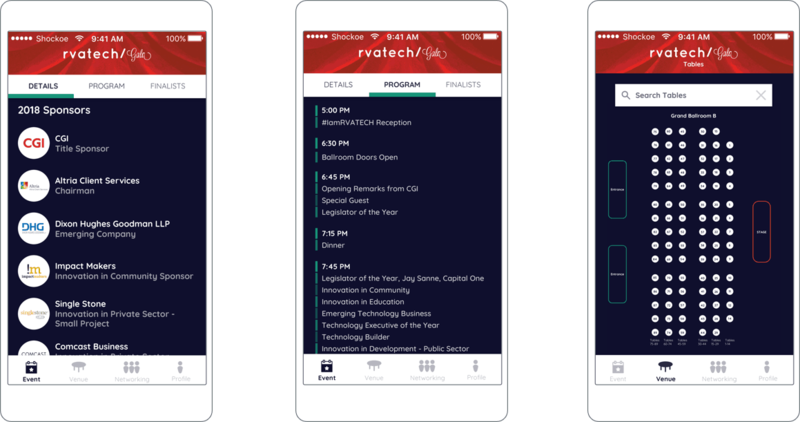 With its easily replicated components, seamless native integration, and rapid deployment, Shockoe was able to take the Gala app from design to deployed in less than eight weeks. Before committing design or code, Shockoe worked with RVATech to identify and solidify goals. 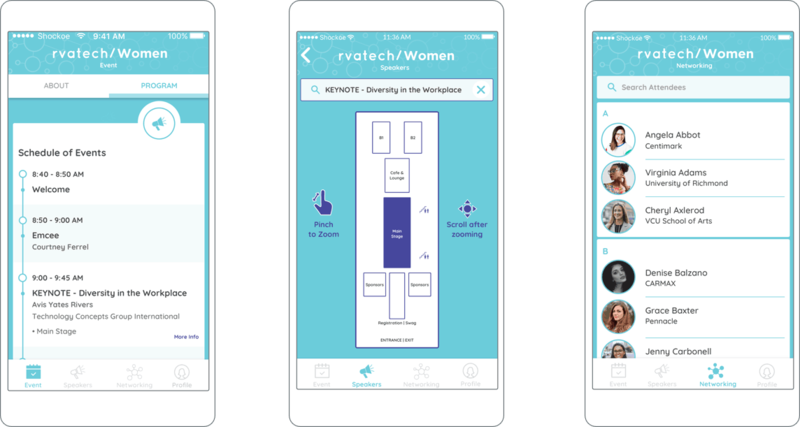 For RVATech, there was a critical goal to convey the event’s brand message to guests and the growing community: Women are impacting the world of tech, and RVATech is a community empowering them to do so. An important message with a fun twist felt like the right approach. 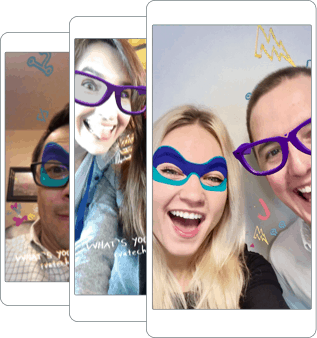 Shockoe designed and built a custom augmented reality Facebook filter to allow users to “unleash their superpowers” and “show their impact.” Users could record videos of themselves in a custom RVATech branded superhero mask. 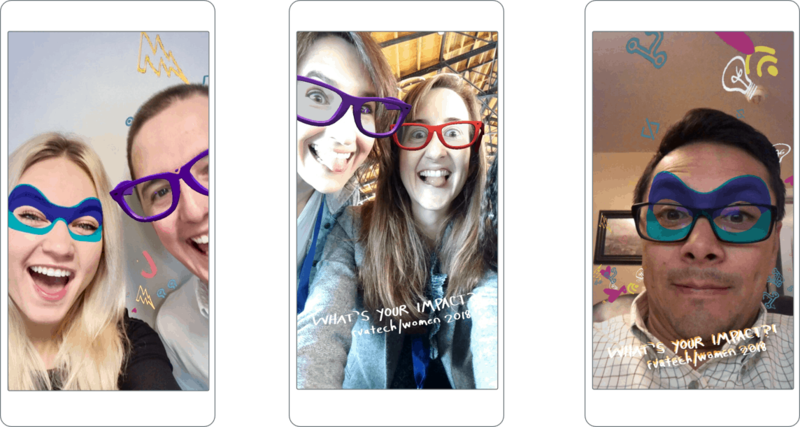 The video could then be shared across social media channels and promote the fast-growing women’s community in Central Virginia. RVATech has made it their mission to keep a fast-growing community engaged and informed. 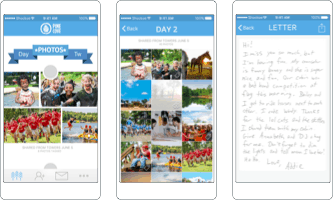 Shockoe has helped by creating an adaptive mobile application that delights members and provides utility beyond the scope of a traditional networking event. 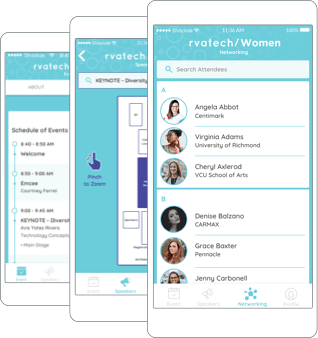 The partnership between RVATech and Shockoe has turned what is often a one-and-done app into an expected and functional part of any RVATech event and a great way for members to stay informed and meet like-minded professionals around Richmond.